After reading Composting is a Redemptive Act by Ed Bruske, I really would like to start composting at home in 2012. I don’t know where to start –and I can’t even imagine how one would start large scale composting in a school cafeteria. I know it can be done and I should ask my friend Sarah Elizabeth Ippel, founder of the Academy for Global Citizenship about composting as they are a zero waste school in my district. 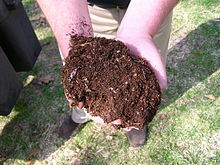 What do you know about composting? How do you start? What materials are necessary? How would you start on a large scale? Debra Moffitt is the kids’ editor at KidsHealth.org, the #1 website on children’s health and development. Nonprofit and physician-led, more than 50 of the nation’s top children’s hospitals include KidsHealth content on their websites. Visit us at www.KidsHealth.org. If you think eating right is confusing, imagine how kids feel. Like grownups, they’re surrounded by nutrition messages (Low-fat!/100% natural!/Packed with Omega 3s!). They want to be healthy and they definitely don’t want to be overweight. But they’re not adults and they don’t buy the groceries, or call all the shots. Plus, they’re immersed in a kid food culture that’s a blizzard of French fries, chicken nuggets, processed snacks, and sugary drinks. So if you’re going to reach them, you are going to need a cute snowman and some simple messages. 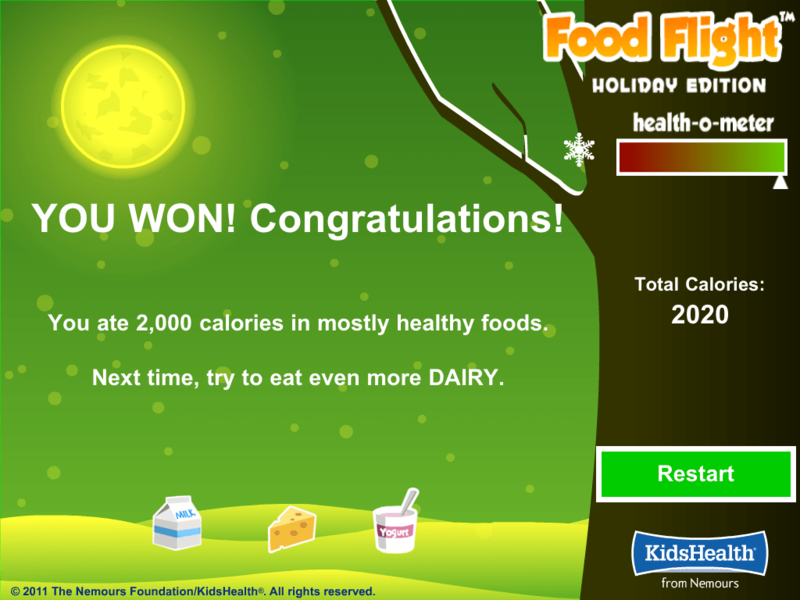 That was our thinking behind Food Flight, a new, free app from KidsHealth.org. 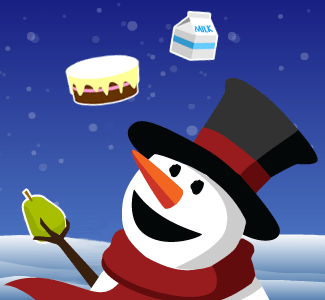 With a tilt this way and that, players can position the snowman to eat the food that’s falling from the sky like snow. The five food groups are well represented (fruits, vegetables, whole grain foods, protein foods, and low-fat dairy), but soda and cinnamon rolls are falling, too. We also mixed in holiday treats like Christmas cookies, pumpkin pie, and candy canes. 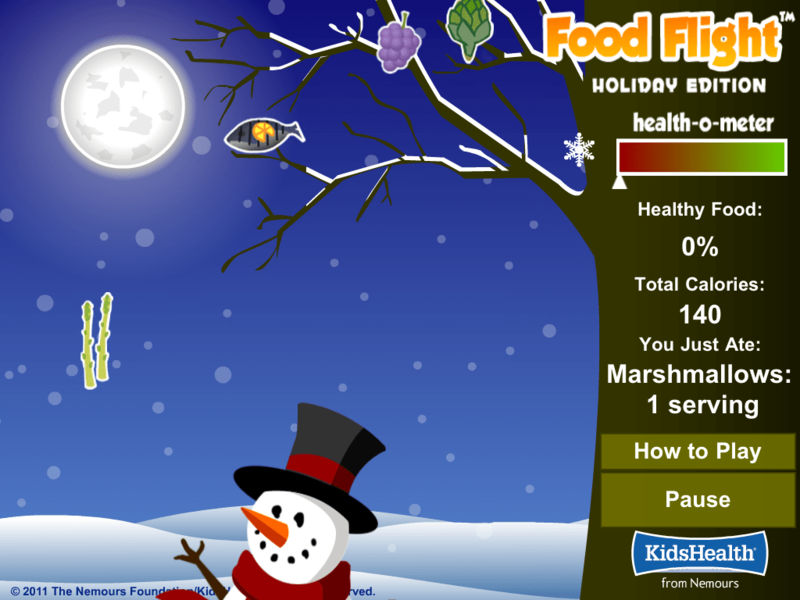 So kids ages 4 and up will like the novelty of their task – feeding a snowman a day’s worth of sky-fresh food. But behind the scenes, Food Flight was designed to teach kids basic rules about balance, choices, and how much is too much when it comes to treats. There’s pressure to reduce subject of nutrition to a few, digestible tips. It’s not that easy. Nutrition is a science, after all, and we’re all trying to apply best practices as those best practices are continually revised and refined. But you have to start somewhere, especially with kids, so we started with these five principles. We hope kids will enjoy our app and families will use it to talk about food choices. Principle 1: Some foods are better than others. A banana is better for you than a doughnut. 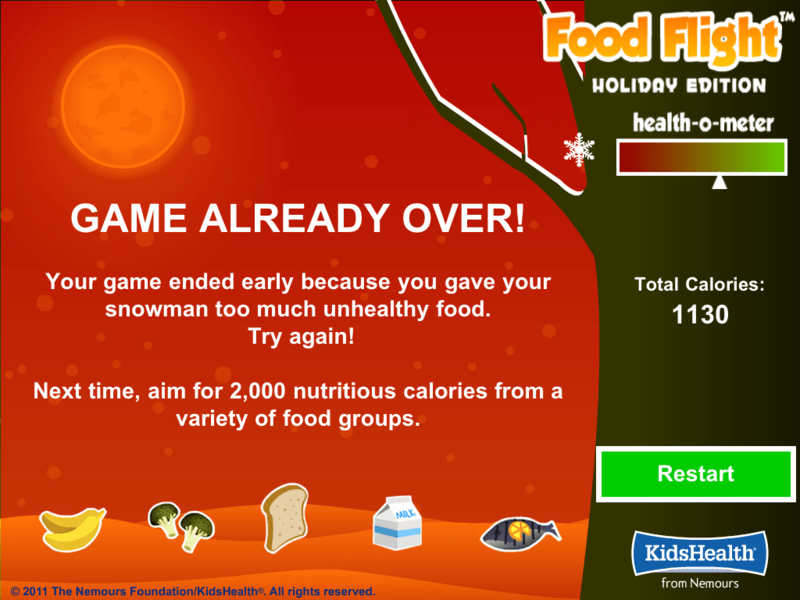 Kids win the game when they feed the snowman all (or nearly all) nutritious foods. Principle 2: People (and snowmen) need a certain number of calories every day. We picked 2,000 calories because that’s an average per day amount for school-age kids. 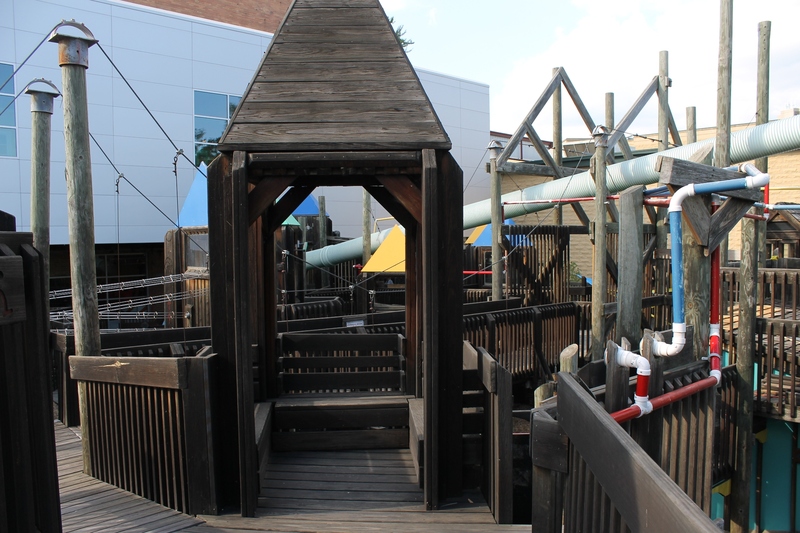 (The range is 1,600 to 2,400, depending on age and activity level.) Daily calories are like a bank account so kids should spend their calories wisely every day. Principle 3: There isn’t much room in anyone’s diet for low-nutrient foods. Everyone needs calories to deliver nutrition. Vitamins and nutrients keep a kid’s body working and growing the way it should. Players win Food Flight by feeding the snowman 90% or more of his daily calories in healthy foods. That means less than 200 calories in ice cream, potato chips, chocolate bars, and soda. The game ends early if kids overdo it. Principle 4: Kids should eat a variety of foods. We used the food groups in the USDA’s MyPlate: fruits, vegetables, protein foods, whole-grain foods, and lowfat dairy. Even kids who win the game will be challenged to play again and focus on their weakest food group. 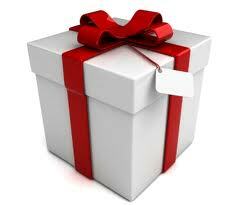 Principle 5: The holidays present a challenge to healthful eating. That’s why we launched this app with a winter holiday theme. Like in the game, kids can have a cookie or candy cane and still win. They just can’t have a dozen of each. Our pediatricians at KidsHealth offer this simple tip: Limit holiday eating to a special day or two and live by these basic principles the rest of the year. Remember that it’s a holi-day, not a holi-week or month! My mom makes the best pumpkin cookies. I have not tried making them gluten free yet (I don’t have a lot of time). They are great without frosting, but if you have the ingredients and the time, you might as well frost them. Sift flour, soda, salt, baking powder, and cinnamon. Cream shortening and sugar. Add egg and beat well. Add dry ingredients, raisins or dates, nuts, pumpkin and vanilla. Drop by teaspoonfuls on greased cookie sheet. Bake 12-15 minutes at 350 degrees. Frost when cool. Makes about 90 cookies. Remove from stove and add 1 cup sifted powdered sugar and 3/4 teaspoon vanilla. Beat until smooth (add more powdered sugar to reach desired consistency). I hope you have enjoyed December’s great family recipes series. I’m brainstorming a new series for January. Any suggestions for future posts are always welcome! If you are like me, you still have a little more to do to be totally ready for the holidays. Luckily for me I have purchased all the gifts, but not everything is wrapped and, sadly, some packages have not been mailed out in time for the holidays. Oh well, it’s the thought that counts, right? Thank you so much for reading my blog and reading my book this year. I hope you enjoy a simple holiday filled with love and fantastic food. I’m taking the weekend off to spend it with my family. Happy holidays! 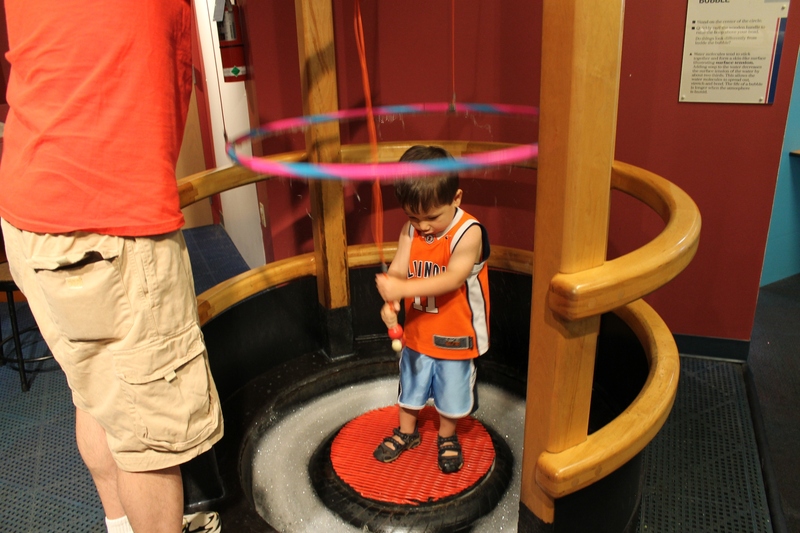 As I blogged about last week…after we milked goats on the farm, we headed out to Discovery Center Museum in Rockford. We had a lot of fun inside the museum, but the real treat was outside. 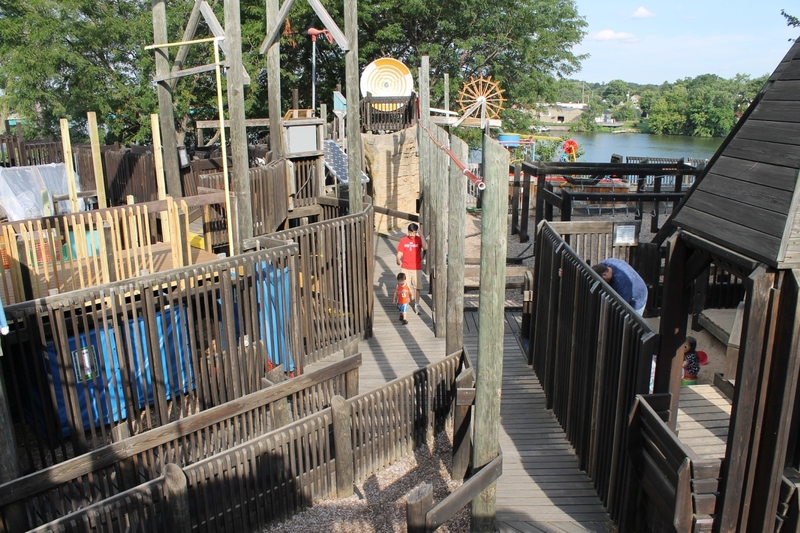 The wooden play area and maze was huge, with swings at one end. 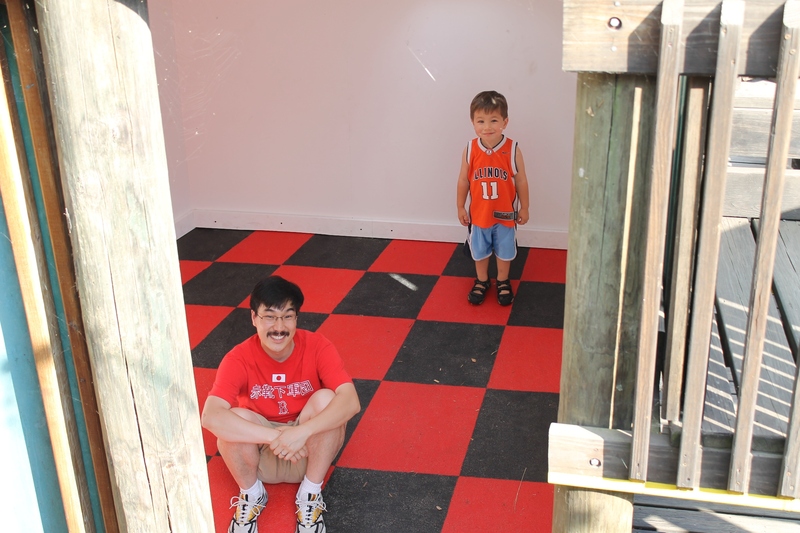 It was so fun for my son to run and jump on the wooden walkways. 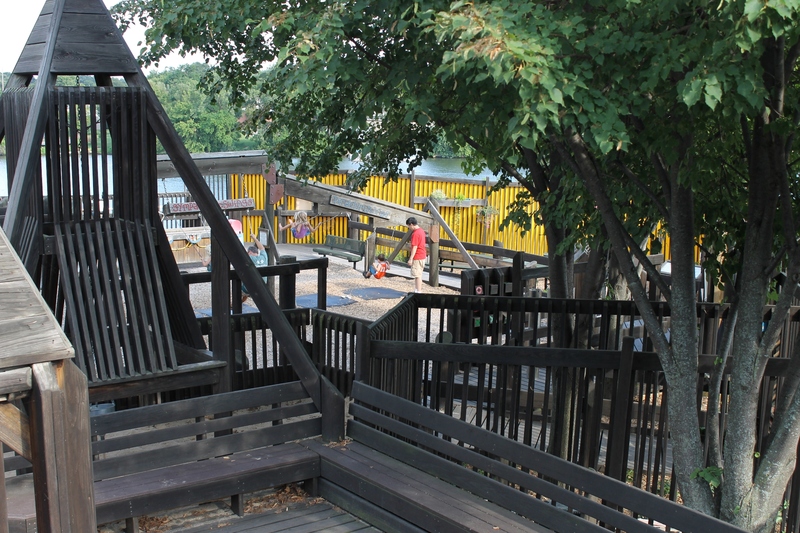 The museum is situated along the river (pictured above — top corner). I had no idea there was a river in Rockford. Unfortunately, as we were leaving I didn’t snap any pictures of the bridges going over the river (I was driving so that would have been dangerous), but they were pretty, too. 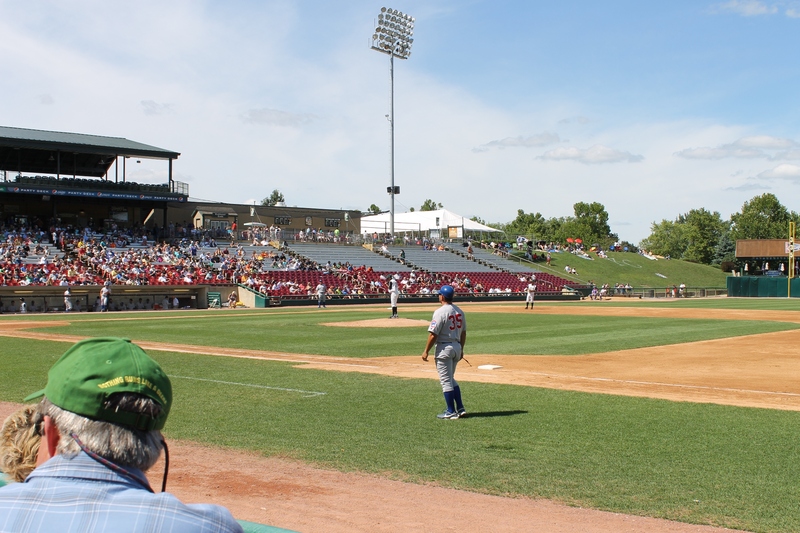 When we left Rockford, we swung down further south to catch a minor league baseball game, the Kane County Cougars. 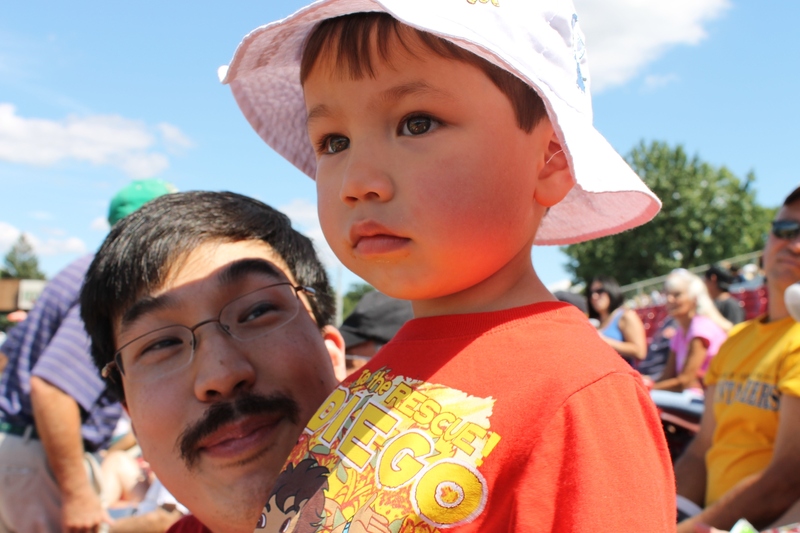 That weekend was all about our son: milking goats and hanging out at our CSA farm, going to a children’s museum, and attending our son’s first baseball game. The field — that day was so hot. I’m missing that weather now. Along with non-profit partner Seven Generations Ahead, I ran Truck Farm Chicago this year. It’s a mobile farm in the back of a pick-up truck (running biodiesel). We use the farm-on-wheels as a prop to connect students to food and conduct programming around health. When the opportunity to run Truck Farm came up, I jumped. I grew up with vegetable gardens, worked on a farm (if you count volunteering at City Farm), know a bit about the food system and have eaten in plenty of CPS cafeterias. As a visiting children’s book author, I’ve been told by teachers that I’m crazy when I ask to eat the same food the kids eat. If the food system is broken, where insanity is sanity and sanity is insanity, it’s exhilarating to join the movement for something better. Obesity, high blood pressure, type 2 diabetes and some forms of cancer are 100% preventable. So working with kids preventing problems makes sense. Kids learn no matter what. If we serve them foods loaded with sugar, fat and salt, they learn it’s OK to subsist on foods loaded with sugar, fat and salt. And then we demand their growing, restless bodies sit in their desks all day and prepare to perform well on tests. Crazy. We advocate taking—and teaching—a wider view, where understanding connections leads to making better food choices and to joining the movement to build a better food system, including more jobs and more vibrant communities, with lower healthcare costs and cleaner air and water. Truck Farm’s thrilled to be one tiny participant in a the food movement who’s lucky enough to spend time with kids. 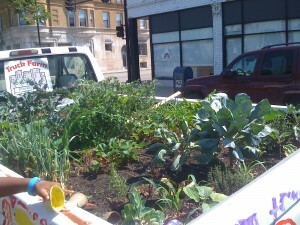 Growing food in the back of a truck is a novel concept. No matter the neighborhood, the ethnicity or the age of the students, Truck Farm has a ‘Wow’ or ‘Cool’ factor. We leverage that attention for practical education. We ask students all sorts of questions, from ‘What’s growing here?’ to “Why do we eat food?” and “Why does it matter what we eat?” We always do tastings. Spinach, scallions, basil and chocolate mint leaves were regulars. Strawberries & cherry tomatoes were favorites. My favorite line came from a child harvesting a carrot. He yanked out a small one and said, “Oh, no, not quite ready” and shoved it back in. At markets and festivals, when offering raw leaves, to a child, parents would whisper to us, “my kid won’t eat veggies.” We turn around and their child is chomping on a chard leaf. Sometimes I wish adults would give children more credit. To start, just-picked food tastes better. Plus, if the child is involved (like choosing and picking, or planning and cooking), they’re more likely to eat it. Once kids understand what they eat makes a difference in how their bodies perform, there’s no telling what happens. We had students yelling for more kale once they found out it helped their muscles work better. We were lucky enough to visit several schools on multiple occasions for comprehensive programming, including hands-on cooking classes, classroom nutrition education and garden installs. That will be our model for 2012. Again, we’ll spend more than 75% of our time on the south side & west side of Chicago, reaching kids who bear the greatest burden of the status quo. Boil water and cook the pasta according to directions on the package. In the mean time, pan-fry the pancetta or the bacon. Beat the two eggs (with whites and all). When the pasta is cooked, drain it. Quickly put it back in the saucepan (large is preferred). Chuck in the pancetta. Turn the stove back on and put the pasta back on the fire. Then quickly add the egg and STIR thoroughly, making sure the egg spreads evenly. Don’t cook it too long… You don’t want the egg to become golden or anything… It needs to be yellow and creamy. Take off stove and serve with Parmesan. My husband and I have made this all different ways, gluten and dairy free included. Every time it’s amazing — there are no leftovers. I think the kind of pancetta you use is important. I don’t like the cubed pancetta at all. I like the thinly sliced stuff. And bacon works just fine, but I’m not Italian. I say a half-package of bacon because that’s enough for two people. Also, if you don’t have Parmesan, you won’t miss it. Recently, I bought a very hard Parmesan cheese and decided to see if my system could tolerate it in this recipe (everyone kept telling me that hard cheeses are easier to digest). Good news: I tolerated a little without a problem (my body is healing!). Bad news: It added nothing to the dish and my husband requested that I omit the Parm in the future.